Remember, you will need a waiver for every event you are participaing in! In the past that even included ChEAR Squad and the pasta party (though those are not online yet; check back soon). 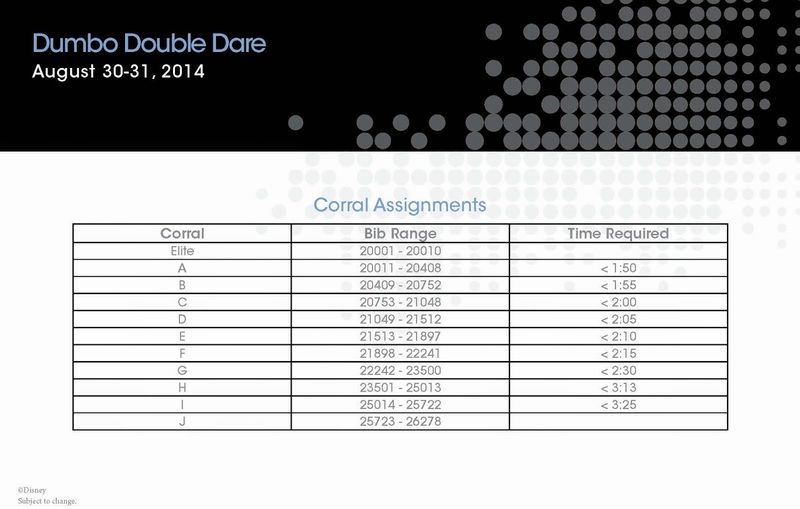 Dumbo Double Dare counts as one event, even though it's two races. Okay...but what does this mean? Well, this should help you in a few ways. First, you will know ahead of time what group to be looking for when it comes to the morning of the race. Hey...it's early...you might not even be awake yet. Any help you can get, right? Second, and more importantly, it gives you a better idea of how much time you will have before the start of the race. Corral A? You are going to want to get to your corral around 5:15. 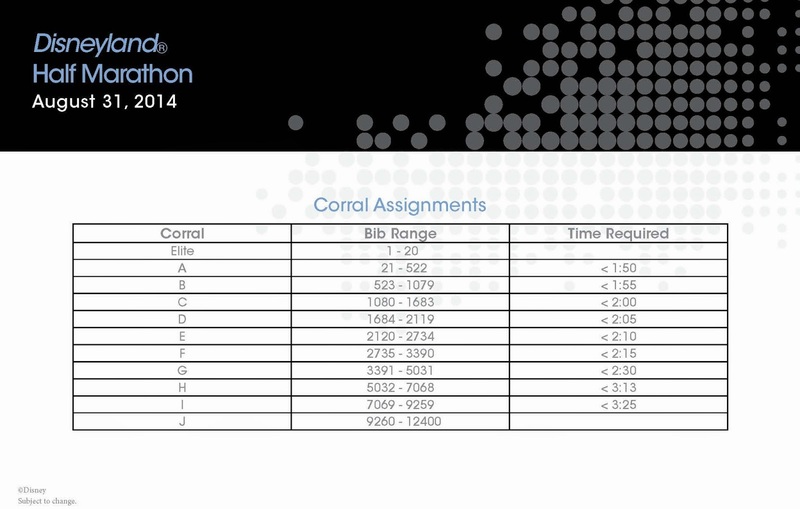 Corral J, you have plenty of time (45 minutes-1 hour) after the official race start before you are off and running. Remember, though, if you are checking bags, they all need to be checked no later than 5:15, regardless of your corral. Now, if it were me and I was in corral J, I would still be in the staging area by 5:15 to join in on the festivities. Disney always does it up BIG! That's why we love running Disney. If this year follows recent suite, there will be about 3-5 minutes between earlier, smaller corrals. 5-10 minutes between the latter corrals. This allows some spreading out on the course, but there will still be some congested parts. Final note for those running for the first time or those who are very nervous about their time and finishing under the 16 min/mile pace (ya know...like, let's say, someone who just had knee surgery 11 days ago maybe...). Try to line up at the front of your corral if you are toward the back. Every little bit of buffer time helps. The "balloon ladies" who keep the pace are the last to cross the start line. They then maintain a steady 16 min/mile pace. All you need to do is stay ahead of the balloon ladies and you're good. So...where are YOU?!?!? Will I see you in Corral B? The rest of the family is spread out in other corrals too. If you see us (okay...I can only speak for myself, so if you see ME), say hello!!! I'd love to chat during the race. Now go print those waivers and put them in a safe spot!!! Definitely! I'll be so slow this year, I don't think I'll be stopping for characters, except for maybe during the 10k. Not happy about the finish time span for corral H. Am just frustrated because I have a predicted finish of 2:31 and planned on running with the 2:30 pacer. Dreading the logistical nightmare of locating and maintaining proximity in a crowd with such mixed speeds. They actually added corrals this year, so I wouldn't worry too much about "mixed speeds" as I think most people who are in each corral are at the same submitted speeds. HOWEVER, that doesn't take into account those who don't plan to run even close to their speed or picture stops or run/walkers or first-timers. Good luck on 2:30! I'm sure you can do it! For a little extra confidence, though, my first DL Half I was in the last corral and ran a 2:09--up until last August, that was my PR! Run your race! You can do it!!! Let the Disneyland Half Craziness Begin! 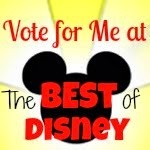 So You Want To Run Disney--Part 7: Get Packing!